Grandmothermath recently visited our Georgia grand kids. Their mom and dad wanted to get away for a few days to attend a medical conference leaving grandmother with the kids which is, of course, exactly what grandmother wanted. 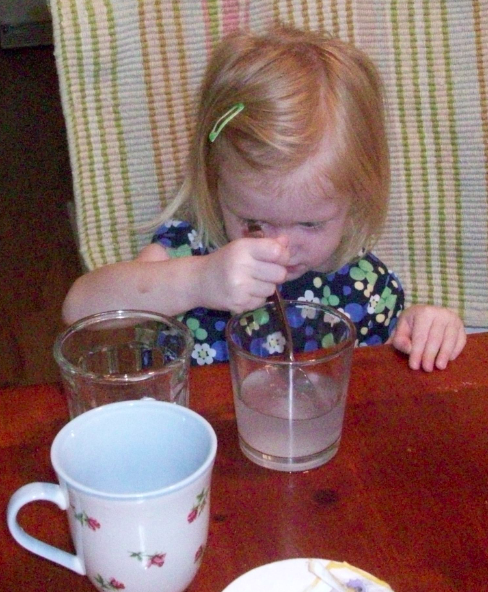 Asher and Kate, both preschoolers, enjoyed combining glasses of water colored with different food colorings (see Archives – March 2011 Another Grandadscience and Food Coloring) so I thought they would be interested in doing another food coloring activity. With that in mind, I emailed grandmothermath the following simple activity, which she did with the kids. 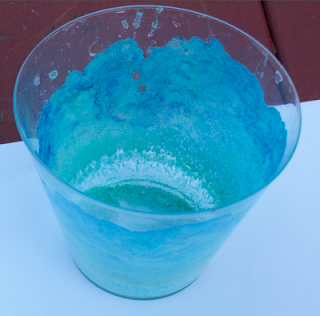 Materials: All that's needed is a box of table salt, a small water glass, food coloring, and a spoon. Have the kids fill the glass with warm water. Tell them to add a teaspoon of salt, stir, and check to see if all of the salt dissolved. If all of the salt dissolved, have them add a second or third teaspoon and stir until all, or almost all, of the salt dissolves. In this picture, Asher is stirring the salt and water. Kate prepares her glass of salt and water. A good idea is to have have kids feel salt in granular form and then try to 'feel' for the salt when dissolved in the water. 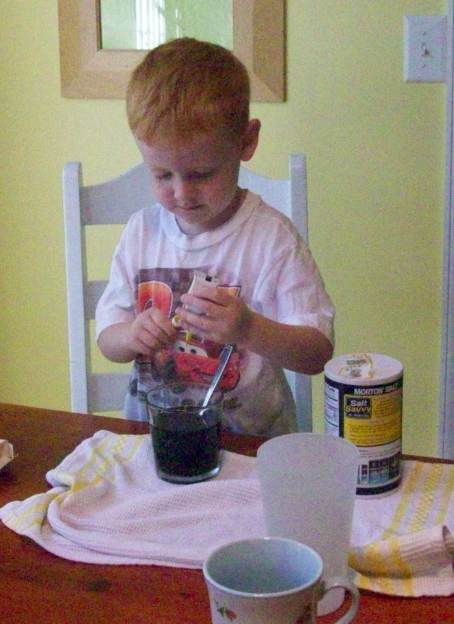 Once the salt water is prepared, Asher and Kate add drops of food coloring to each glass and stir. This is the fun part. Locate a place for the kids to set the glasses where they can observe the slow evaporation (don't try to explain) over a period of days. Below is pictured a glass grandadscience made to illustrate how the colored salt crystals are left after all of the water has evaporated. Grandmothermath had to leave before this occurred with the kid's glasses. Many real-world events, like falling while playing (Asher is a fearless climber), happen in a hurry. For youngsters, these are the experiences that accelerate learning. Events that occur over time are much harder for youngsters to assimilate into their world view. 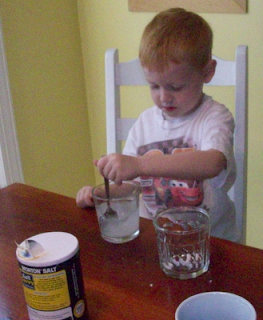 Growing a plant is another great, long-term activity for kids to engage in.